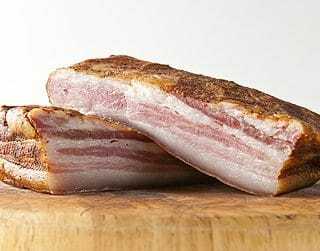 This is a recipe for what’s called ‘green bacon,’ an unsmoked lightly cured pork belly made with just salt and spices, no nitrates. It’s not that I am against nitrates, but sometimes I like a lightly cured, fresher-tasting bacon with my sauteed greens, pasta or beans. I adapted my recipe from Victoria Wise’s American Charcuterie, which is one of my favorite charcuterie books; Wise was one of the first chefs at Chez Panisse in Berkeley back in the early 1970s. My version of this bacon really hinges on juniper berries, which are available in some good supermarkets, or you can order them online. Because there is no smoke, no nitrate and such a short cure, this bacon only lasts about 10 days in the fridge, tightly wrapped. But it freezes fine. A word on the pork belly: Buy the best quality you can find, preferably from a local farmer who raises high-quality pork. Older pigs make better bacon, and it goes without saying that fatter pigs make better bacon. Get a lidded container just about large enough to contain the pork belly. Cut the belly into a nice rectangular shape to fit. 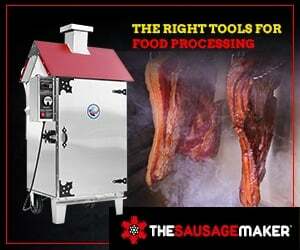 Use the trimmings in sausage, or slow-cook them. It is your choice to leave the skin on the belly or cut it off. If you are planning to slow-cook your finished bacon, like with beans or by itself, leave the rind on: It is delicious once cooked. But if you plan on this with sauteed greens or in place of commercial bacon, slice the rind off carefully with your sharpest knife. Mix the salt and all the spices and rub them into the pork belly. Coat the belly with any remaining spices. Put the belly in a large freezer bag or wrap in plastic wrap or butcher paper, and then put it into the fridge. Keep the bacon in the fridge for 5-6 days, depending on how thick it is. Really thick belly needs more time. Turn over the slab every day. It will weep moisture; this is a good thing. Just leave it in the container. After the bacon is cured, take it out and rinse it off with cold water. Pat the bacon dry with a paper towel and set it on a wire rack to dry a bit. You can leave it on the counter for a few hours, or overnight in the fridge. Cut it into pieces you think you'll use within 10 days and freeze the rest in plastic, then foil. Or, better yet, vacuum seal them. Note that the prep time does not include curing time. Im very interested to learn some of charcuterie recipe from your website, as my first try I choose to make the unsmoked bacon. Trying with a smaller batch, just around 1 pound pork belly to learn the process. My question is how do you know the meat is already cured or not, I read some article that the cured meat will turn dark red colour if using the pink salt, but in your version of unsmoked bacon is it gonna turn red also?? I’ve keep the meat for a five days and see the colour of meat is darker but the inside is still pink colour. I tried a similar recipe myself and and searced a lot before I try. So I think I can help you about your question. After 5-6 days, take a slice from meat and wash it. And than cook it and taste it. It should give you an idea about its condition. I am doing it this way, I hope it is helpful to you. I havent tried making bacon before and have been given some belly pork which i would prefer to use as bacon. Can i still use this method to make the bacon if the pork belly has been previously frozen? Abi: Yes. You can make it with pre-frozen meat, just don’t refreeze it. If I wanted to smoke this bacon (SWMBO says bacon must be smoked) other than (maybe) adding nitrites, and of course putting it in the smoker, are there any modifications to the recipe that is necessary? Also, is there any advice on low temperature (i.e. 130-140F, so not true “cold smoke”) smoking you can give? I read that smoking to ~150F internal results in bacon that won’t crisp when fried. I want the smoke flavor, like crispy bacon, and refuse to use liquid smoke. My current smoker setup is not capable of holding temps under 130F and that requires a pretty cold day. 140F is more likely as a minimum.